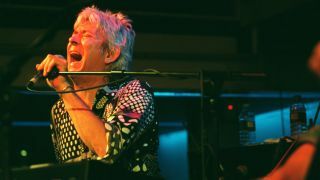 Rock And Roll Hall Of Fame inductee Ian McLagan, the legendary keyboardist with both the Small Faces and the Faces, died today at a hospital in Austin, Texas, after suffering a massive stroke. He was 69 years old. McLagan got his start in 1965, when he joined the Small Faces. The group hit the charts with songs such as Itchycoo Park, Lazy Sunday and Tin Soldier. The group disbanded after guitarist Steve Marriott left to form Humble Pie, reforming as the Faces with new members, singer Rod Stewart and guitarist Ronnie Wood, both from the Jeff Beck Group. The Faces enjoyed massive success with hits such as Stay With Me, Ooh La La and Had Me A Real Good Time before breaking up in 1975. In the mid-'70s, McLaglan joined Wood as a touring keyboardist with The Rolling Stones and eventually settled in Austin. Renowned for his use of the Hammond B3 organ and the Wurlitzer electric piano, McLaglan formed his own group, The Bump Band, and also performed with artists ranging from Bruce Springsteen and Bob Dylan to Chuck Berry and Jackson Browne. Most recently, McLaglan performed with a new band called The Empty Hearts, which includes former Cars guitarist Elliot Easton, Blondie drummer Clem Burke, Romantics guitarist and singer Wally Palmer, and Chesterfield Kings guitarist Andy Babiuk.